My Niece sent me this picture that she found on the internet. THIS IS A CAKE, PEOPLE!! A CAKE! Isn’t it gorgeous? I don’t who made it, or what company created it, but I just thought it was gorgeous and I wanted to preserve this image as part of my blog. This cake also presented a challenge to me. A challenge I kinda liked. This image represented an “in- my-face” challenge that spoke to me and said “OK little Ms Tailorchick, REACH with your sewing skills and get to the point where you can sew and create as good as that cake is decorated. 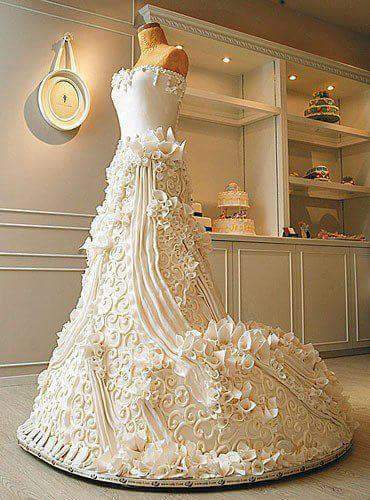 DO in fabric what the pastry chef did with butter cream and sugar paste”. I am sure they took a picture of the cake because it represented that pastry chef’s ‘personal best’ at that moment. Inside of me there is this little woman who is crazy enough to think that I can achieve that level of creativity in sewing skills with my own two little hands. Images mean different things to different people. There is something about this cake image that is challenging ( inspiring ??) and saying to me REACH FOR IT, Girl-JUST REACH FOR IT !!! Reach for those better sewing skills. Not to prove anything to anyone. Not to ” worship ” sewing or feel that the craft is ” ALL of life” and everyone who sews should be or feel like I feel. Not at all. But really just for my own personal satisfaction. Really just to find and to express the limits of my own creativity through sewing. If others can find the way to express their creativity with that kind of excellence, and I want to do that as well, why can’t I? Why can’t I reach for that? Looking at this cake makes me want to at least try. What the heck- got nothin’ to lose. And my sewing skills might get better. Yeah, yeah there are books to consult, and senior sewists to seek out and to learn technique from. There are past notes from my sewing teachers and mentors to read and re-read, and finding the time to practice sewing skill and technique so that they are executed well in the garment takes time I barely have in my schedule. But doing this kind of stuff is what makes the sewing journey interesting and fun for me. This is MY version of sewing. I don’t only sew to cloth myself, I sew for the fun of creating “something from nothing” and expressing any artistic streak that I might have. Stretching and challenging my sewing skills to do something new or something BETTER QUALITY than I did before, and seeing the results that I feel have reached a higher standard or a better “personal best” in sewing than what I had before I “stretched”, is just plain old fashioned PRICELESS. THERE— I have had my cake. Now I have Cindy too. So here is further boasting about my students. As mentioned and promised in my last post- I was able to coax a picture from Cindy of herself wearing the vintage dress she was working on to wear to a friend’s August wedding. 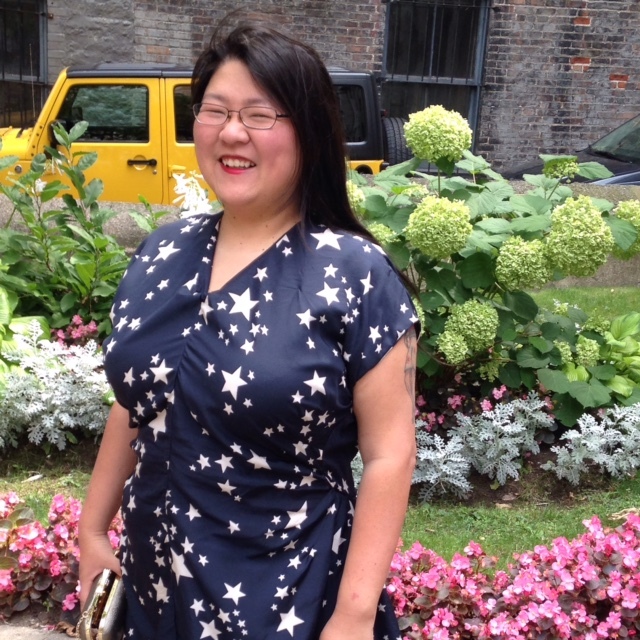 Here Cindy is featured in the finished dress she made. I think she looks great. I think the print she chose was just the right one for her and her happy personality. I think she was just the right “arm candy” for her “Mr Man” at the wedding. Okay- Cindy gave me permission to mention that SHE KNOWS, PEOPLE that her center front may be what she called “a little wonky”. *SIGH* NO MATTER, Cindy. I think you looked good in the dress on that day, and If I had not mentioned it to YOU– dear reader— you may or may not have noticed anything about Cindy’s dress center front. I know what Cindy’s pattern looked like, I see the results she achieved, I can tell where she had a “make it work” moment with the Pattern and how her sewing results were different from the pattern, but I’m not telling. AND C’MON everyone – let’s be real. Not EVERY day is ” expressing sewing creativity with excellence” day. That’s why sewing is a skill that is ‘practiced’ and the enjoyment should come from working through the sewing process as well as getting the results. At least I think so. And haven’t ALL of us sewing folk out there in blog-land had “make it work” moments? ( aka- Using “creative ” sewing technique with ” different” results. Or sewing late into the night to get the garment finished for the next day. Then there is the other favorite—sewing and finishing up the garment up to 10 minutes before we wear it out the door— all for the sake of wearing the PLANNED sewn garment we WANTED to wear on THE DAY we WANTED to wear it. That is why we “make it work” when we have to. Anyway- Good job Cindy! We’ll work on “wonky” later. No worries! Jeans for me and the “emergency bride” ( I’ll explain ) in my next post. Happy Summer’s done. Bring on the Fall.